Autoharp Activities. Place the autoharp on the floor between you, on your lap for more control, or on their lap if they can tolerate the vibration from the autoharp as it is played. 1. To practice counting, ask your child to count the strings on the autoharp as you pluck each string with a pick. Assist by counting with them. 2. Alphabet recognition: ask your child to press the “A”. If they get it right, use your pick to strum while they hold down the “A” key. Repeat with another key. 3. Alphabet recognition and motor coordination: Ask your child to press the “A” key with the pointer finger on one hand and strum the strings with a pick using the other hand. Repeat with another key. 4. Letter recognition: Show the child a card with a letter printed on it. Proceed with #2 and #3. 5. Play a simple song such as “Old MacDonald”. 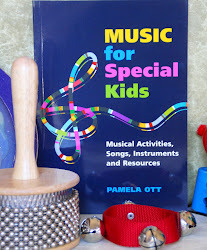 Have your child sing along or assist with the strumming. Old MacDonald had a farm., Ee-i-ee-i-oo. Old MacDonald had a farm, Ee-i-ee-i-oo.